The project's $210 million first phase includes 122,000 square feet of restaurant and entertainment space, 105,000 square feet of retail and 107,000 square feet of office space. 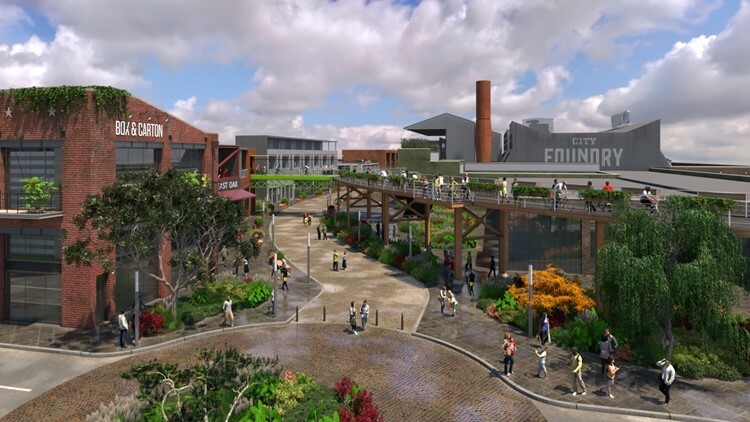 ST. LOUIS BUSINESS JOURNAL — The developers behind the City Foundry project in Midtown have added on to its list of tenants. Lawrence Group, the team behind City Foundry, has added a new event space concept by Butler's Pantry, a new office lease for Great Rivers Greenway and five new food vendors for the food hall. The project's $210 million first phase includes 122,000 square feet of restaurant and entertainment space, 105,000 square feet of retail and 107,000 square feet of office space. "From the beginning, this project has been about creativity and vision," Steve Smith, principal owner of City Foundry and CEO of Lawrence Group, said in a statement. "Our team took a former industrial site and is transforming it into a hub for tenants and guests who appreciate modern concepts in food, commerce and entrepreneurship." Joining the already long list of tenants is 18Rails | The Venue @ City Foundry STL from Butler's Pantry, St. Louis' largest caterer with $12 million in 2018 sales. Butler's Pantry will transform the former factory space into a new venue that can accommodate up to 700 people. Click here to read the full story on the St. Louis Business Journal.